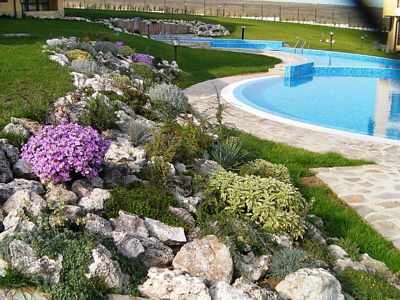 Rockery Spain Building a rockery is not difficult and they are great features for the garden, with a huge choice of rock types and sizes. 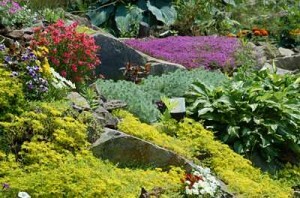 Winter is a great time to build a rockery, for one reason if no other – it is heavy work, and heavy work is better done when the weather is cool. 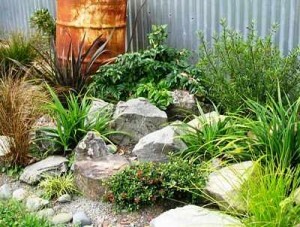 The plants that are normally planted – and grow well – in rockeries, are those which are happy in dry areas; Succulents, cacti, grasses, bulbs, ground covers, flowering plants, etc. 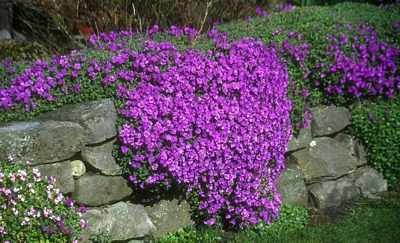 Any slow or low growing plant will normally be ok – providing that it is suitable for dry conditions. Why grow plants amongst rocks? A sunny, well-drained spot is best. The most obvious place to build a rockery is on a slope or a mound in an attempt to imitate nature. To achieve this effect, seek inspiration from nature, then try to imitate what you see. 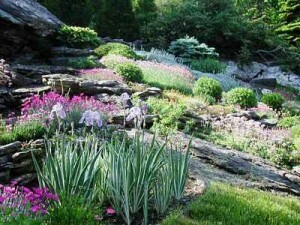 To ensure that the rocks are safe and secure, at least half, and preferably two-thirds of the rock should be buried in the ground. Create a solid foundation – either dig a trench down to solid sub-soil, or if the wall is high and heavy, dig a trench and pour a concrete foundation below ground level. 2. Build the first layer of rock and then pack a good quality loam behind the rock. 3. Leaving the odd pocket exposed to plant in, add the next layer of rock – with the face slightly behind the first layer (so the wall has a slope backwards). 4. Pack soil behind the second layer. 5. Continue with further layers leaving pockets for planting as you go, and being careful to retain the slope backwards. 6. Plant the pockets of exposed soil as soon as you are finished – the plants need to start growing ASAP so as to hold the soil in place. Once you have chosen the site for your rockery you must then choose the appropriate type of rock: Sandstone, granite, volcanic rock, etc. 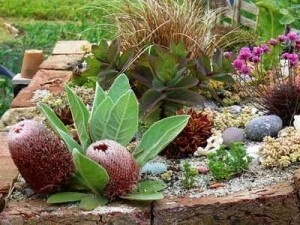 Imitation rocks are also available from some garden centres. 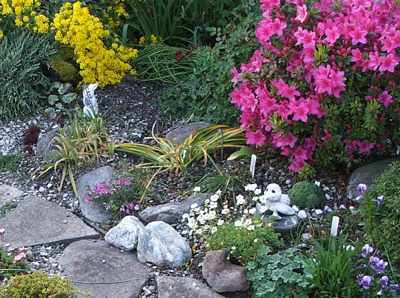 Most people favour natural shaped rocks, but cut blocks can also be used to create interesting rockery effects. Regardless of type, the sizes of the individual rocks will need to be in scale with the overall project. If the rocks you use are very large and heavy, you will need to be smart in the way you handle them. 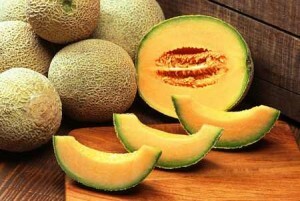 The quickest method is to hire a machine (such as a small loader/tractor) for a day. Be careful though – rough handling can scratch the surface of the rock and destroy its natural appearance. Medium to large rocks can be moved by hand with the help of friends, a wheelbarrow, or a trolley. If you lift heavy rocks, make sure you lift correctly: Straight back, bended knees – let your legs, not your back, do the lifting. There is no simple rule for deciding whether a rock is in the right position. It depends upon the shape of the land, the position of other rocks, the surrounding plants and the visual effect you are trying to achieve. Sometimes it will be necessary to adjust the rock more than once so that the best side of the rock is facing up. Rockeries can be made to fit any space available. 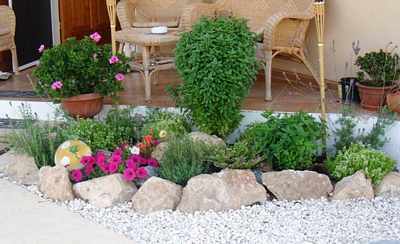 If you do not have the room for a large rockery, you can create a good result with the creative use of shrubs and just a few strategically placed rocks. Have fun! This is an invitation to come and have a look at another Groups Facebook page. Spain Info rockery, San Francisco De Asis, Urb Marina, San Fulgencio, 03177, Alicante, Spain.